Photo by Matthew Smith from the Torontoist Flickr Pool. 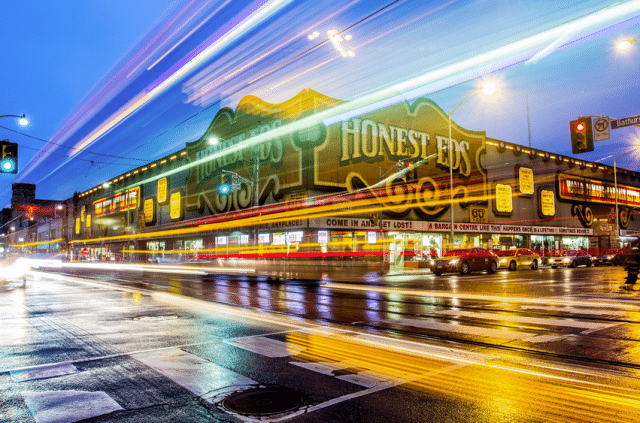 With plans for 1,000 purpose-built rental units, the recently released Honest Ed’s proposal defies Toronto’s typical development narrative of condos, condos, condos. But real estate analysts say that narrative could be changing, as a shift to rental accommodations may indicate broader trends for young professionals entering Toronto’s real estate market and for the economics of Toronto development in 2015. With the average cost of a single-family house in Toronto at $606,700 and property values rising faster than income, home ownership is increasingly out of reach for many young adults. Condo prices are on the rise too, with a monthly mortgage payment becoming more consistent with what it might cost to rent. That’s without factoring in condo fees, which can cost an additional $500. “In the last couple years, especially 2014, we’re seeing pockets in the city where purpose-built rentals are being built, with amenities that are more comparable to the condo market. We’re seeing more luxury rentals, where prices are higher,” says Dana Senagama, principal of market analysis for the GTA at the Canadian Mortgage and Housing Corporation (CMHC). In the last 15-20 years, the city hasn’t seen much construction of purpose-built rentals, but that doesn’t mean people aren’t renting. “If you’re looking for a rental unit that was completed over the last few years, you’ll more likely be looking at investor-owned condominiums or apartments,” explains Jason Mercer, director of market analysis at the Toronto Real Estate Board. With new purpose-built rental apartments, like those proposed for the Honest Ed’s site, young professionals or millennials are able to live close to downtown, in comparable conditions to a condo, without having to commit to monthly mortgage payments or long-term time commitments. 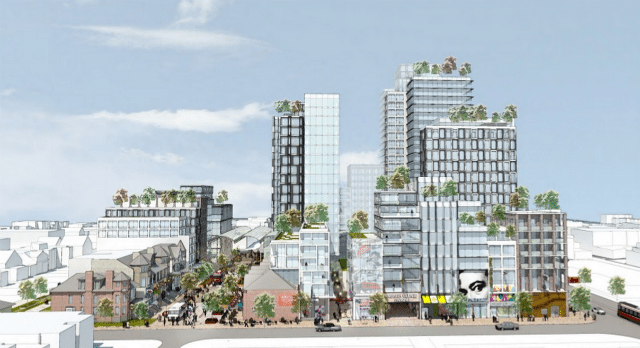 From developer Westbank, and image of what the proposed Honest Ed’s site might look like from Lennox Street looking north. High job turnover plays a factor in this lack of committment, as there’s an increasing need for temporary housing types among young professionals. “Millennials don’t stick around in the same job for 20 years―they job hop and move around,” notes Senagama. A CMHC report shows that as of last September, the number of rental units under construction was 2,212―nearly double the amount that were built the previous year. At the end of last year, the condo vacancy rate was 1.3 per cent, and it has been consistently low for the past five years. But the economics could be adjusting with the demographics. Pre-construction sales for condominiums used to be around 70 per cent before developers could secure construction financing, but now it’s closer to a more prohibitive 80 per cent. Long-standing condo developers, like Rockport Group, are transitioning into the purpose-built rental market, an example being their new 27-storey apartment building going up at Yonge and Eglinton.